Wolves secured promotion back to the Championship after earning victory against 10-man Crewe. 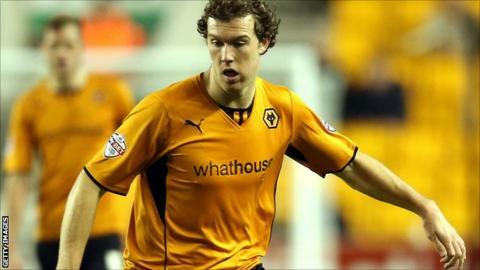 Kevin McDonald's deflected shot and Dave Edwards's strike ensured Wolves bounced back at the first attempt following their relegation last May. With four games remaining Kenny Jackett's side also know that two more wins will secure the League One title. Crewe had striker Chuks Aneke sent off on the stroke of half-time for elbowing Richard Stearman. They remain in the bottom four but are level on points with Carlisle and Tranmere above them. Wolves' clean sheet was their 24th of the season - a new club record in the league. Jackett's men led at the break thanks to McDonald's fortuitous strike but it was well deserved. Earlier Bakary Sako's free-kick and Michael Jacobs's curling strike forced decent saves from Crewe keeper Ben Garratt. Crewe's task was made harder by Aneke's dismissal and with a man advantage Wolves pushed for a second, with Sako seeing his strike deflected into the side netting. Edwards also went close when his strike from distance was well saved by Garratt. But the Wales international midfielder was successful a few moments later, finding the net with a superb strike on the turn to double Wolves' lead. Carl Ikeme was rarely tested in the Wolves goal other than a save from an Uche Ikpeazu effort as he earned their 24th clean sheet of the season - a club record in the league. Wolves' victory also takes them to 93 points - a new club record for points in a season, beating the 92 that they picked up in winning Division Three in 1988-89. "It's a great feeling to get promotion with four games still to go, and now we have to look forward to get the title, which is what we want. "We were always in there at the top of League One, which has a very high points total and has all the way, but we've been consistent. Our defensive record has been excellent. "We definitely want to go up as champions - we want to finish first and it's in our hands. "Our next two, against Rotherham and Leyton Orient, are big games and ones that we should look forward to." Match ends, Crewe Alexandra 0, Wolverhampton Wanderers 2. Second Half ends, Crewe Alexandra 0, Wolverhampton Wanderers 2. Mathias Pogba (Crewe Alexandra) wins a free kick in the defensive half. Corner, Wolverhampton Wanderers. Conceded by Matt Tootle. Attempt blocked. Scott Golbourne (Wolverhampton Wanderers) right footed shot from outside the box is blocked. Anthony Grant (Crewe Alexandra) wins a free kick on the left wing. Attempt saved. Lee Evans (Wolverhampton Wanderers) left footed shot from outside the box is saved in the centre of the goal. Attempt saved. Billy Waters (Crewe Alexandra) right footed shot from outside the box is saved in the bottom right corner. Corner, Crewe Alexandra. Conceded by Richard Stearman. Foul by Richard Stearman (Wolverhampton Wanderers). Substitution, Crewe Alexandra. Billy Waters replaces Bradden Inman. Substitution, Crewe Alexandra. Mathias Pogba replaces Uche Ikpeazu. Attempt saved. Scott Golbourne (Wolverhampton Wanderers) left footed shot from the left side of the box is saved in the centre of the goal. Substitution, Wolverhampton Wanderers. James Henry replaces Bakary Sako. Goal! Crewe Alexandra 0, Wolverhampton Wanderers 2. David Edwards (Wolverhampton Wanderers) right footed shot from outside the box to the bottom left corner. Assisted by Sam Ricketts. Danny Batth (Wolverhampton Wanderers) is shown the yellow card. Attempt saved. Lee Evans (Wolverhampton Wanderers) right footed shot from outside the box is saved in the top centre of the goal. Danny Batth (Wolverhampton Wanderers) wins a free kick on the left wing. Attempt missed. Bakary Sako (Wolverhampton Wanderers) left footed shot from outside the box misses to the left. Attempt missed. David Edwards (Wolverhampton Wanderers) left footed shot from outside the box is too high. Mark Ellis (Crewe Alexandra) wins a free kick on the left wing. Corner, Wolverhampton Wanderers. Conceded by Ben Garratt. Attempt saved. Bakary Sako (Wolverhampton Wanderers) left footed shot from outside the box is saved in the top left corner. Second Half begins Crewe Alexandra 0, Wolverhampton Wanderers 1. Substitution, Crewe Alexandra. Liam Nolan replaces George Evans. Chukwuemeka Aneke (Crewe Alexandra) is shown the red card for fighting.